Queen of England between 1558 - 1603. She had a small council of advisors. Her chief advisor was William Cecil. There had been many years of religious change and arguments. Elizabeth settled the unrest over religion. In 1599 she was made 'Supreme Governor' of the church instead of 'Supreme Head'. She hoped this would please the Catholics. To please the Protestants she made all the churches use Thomas Cranmer's Prayer Book. Elizabeth did not marry, but she did meet many men who wanted to marry her. Sir Robert Dudley was a favourite with her. She also met princes from Spain, France and Sweden. If she had married any of them it would have brought their countries closer together. When she became queen the country was very poor so Elizabeth did not have any wars against other countries because wars cost money. She made peace with France in 1564 and did not fight against Spain until 1585. Elizabeth did not have palaces built, she sold off some of the royal land. Every summer she would visit noble families and stay with them. They had to provide entertainment and food and pay for it as well. These were called her 'progresses'. When Elizabeth went of a 'progress' the ordinary people of England could see her. She was a good rider and she wore fine clothes and jewels. Sir Francis Walsingham was head of her secret service. Elizabeth had cousin Mary Stuart (Mary Queen of Scots) who would try and become queen when she died because she did not have any children. Elizabeth had Mary imprisoned and eventually had her executed in 1587. Elizabeth was queen when Drake and Howard defeated the Spanish Armada. When she got old she wore a red wig to cover her grey hair. She liked sweet foods and these had made her teeth go black. 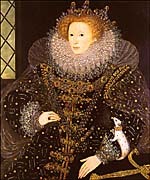 She died on 24th March 1603. During her long reign of 45 years as queen, England had become a strong country in Europe. There had been no civil wars. 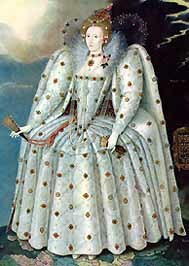 Elizabeth was the last Tudor monarch. She named King James of Scotland, son of Mary Stuart to be king.